Click to viewWhat do you do with a 25-meter-high acrylic glass cylinder, 238,000 gallons of sea water, 2,600 fish from 56 different species, and two divers? The Aquadom, the largest cylindrical aquarium in the world, that's what. In its core there's an elevator that travels through a cylinder of glass. As you will see in the videos after the jump, it's simply stunning. 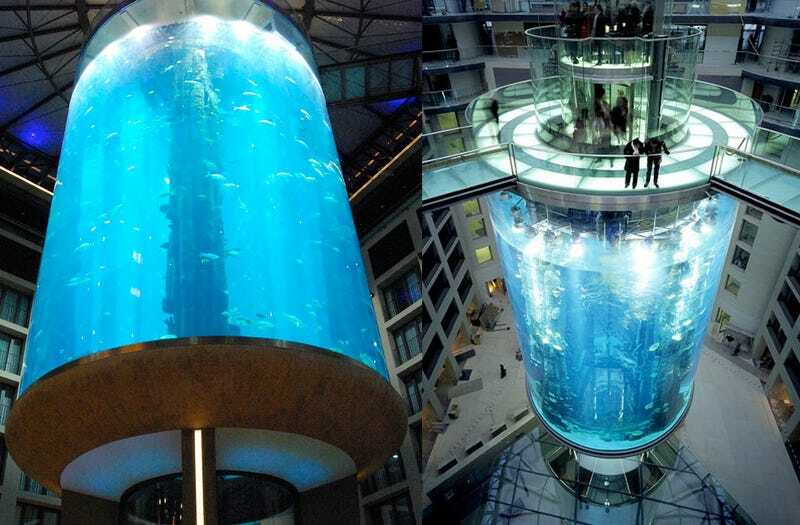 Located in the atrium of the 5-star Radisson SAS Hotel in Berlin Mitte, the $18.8 million aquarium is 36 feet in diameter and sits on a 29.5-foot-tall concrete foundation. Without a doubt, the most impressive thing about the aquarium from an engineering point of view is the glass surface. Built by Reynolds Polymer Technology, it required 41 R-Cast pannels, 26 for the outside cylinder and 15 panels for the inside, plus 16 on-site bonds. The precision of the work, required to hold that water volume and pressure, it's amazing. Reynolds is specialized in creating this kind of aquarium, among other things, which other jewels like the AB Baltic Mega Mall Aquarium, which holds 43,000 gallons of water but has reef sharks, or the aquariums of the famous the Burj-Al-Arab tower, in Dubai. It was built in 2003, but we just came across it as we prepare our trips to CeBIT 2008, which is going to happen in Hannover on March but will serve as a perfect excuse to jump to Berlin in order to see friends for the weekend.